Happy 1st day of October everyone. I though I would share this wonderful Pumpkin Mousse recipe from last year, which will be perfect for this time of the year. Hope you enjoy. 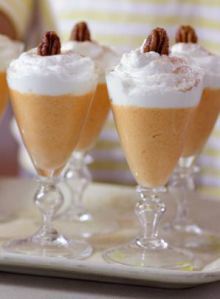 Thanksgiving is around the corner and you, I for one like to make some very easy to make desserts for the big night for the family. Hence, I was very glad I found this sweat treat recipe to share with you. Hope you enjoy. Combine the pumpkin, 1 cup of the heavy cream, sugar, pumpkin pie spice and rum in a saucepan. Simmer mixture over medium heat for 10 minutes. Cool completely. Whip the remaining 2 cups of heavy cream and vanilla to soft peaks. Carefully fold cream into the pumpkin mixture. Spoon mixture into parfait glasses. Refrigerate for at least an hour. This entry was posted in Uncategorized by allaboutme31. Bookmark the permalink.